I love visiting a friend I haven’t seen in a while and exchanging all of the rich details of our lives that we’ve missed out on recently. This usually includes our latest recipes. On a recent trip to Austin, I visited Christina, a friend from high school days. We recalled memories of old cars, getting in trouble with the cops (yes, I did have a little rebellious streak in me once upon a time), new jobs, new friends, and, as always, food. We exchanged lots of fun ideas for eating healthy. She keeps lots of cut up (ready-to-eat) raw veggies in her fridge along with some spinach dip for a easy healthy snack. 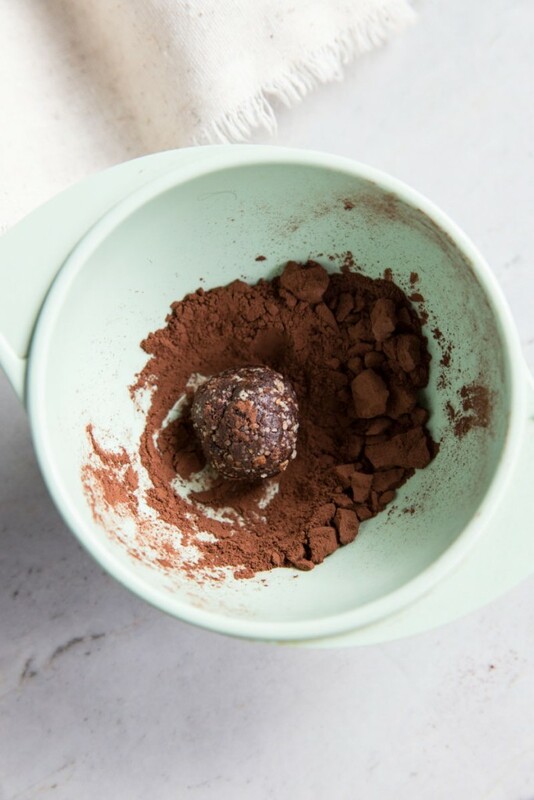 For the sweet cravings that we all have, she makes these little magical date and chocoate balls. Her recipe inspired this post. Josh and I first made these together and all the batter that survived my husbands scavenging was then rolled in rich cocoa powder, resulting in beautiful truffle-like delicacies. The recipe is simple, but you do need a food processor. If you don’t have one, find a friend that does because they are worth it. Also, Christina recommends using Medjool Dates, because they are less dry. 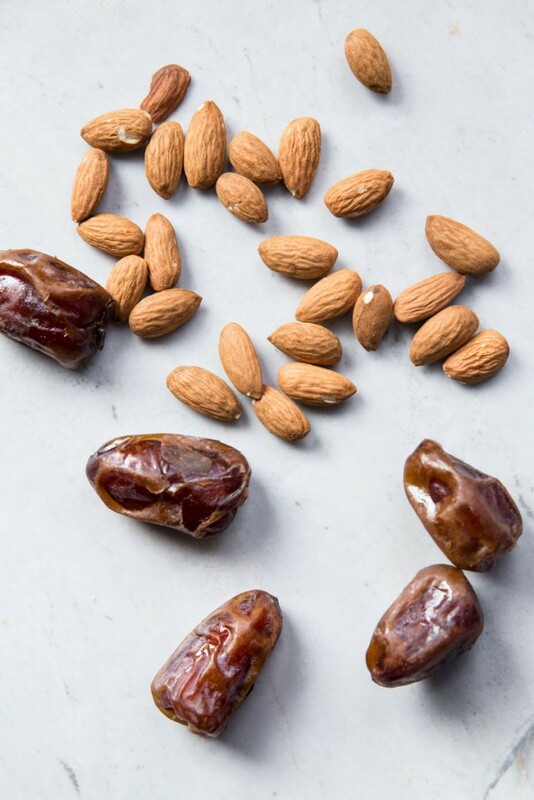 You can find Medjool Dates locally at any health food store or in the bulk isle of most grocery stores. If you need a sweet treat like I do but don’t want to go for the cookie or brownie mid-day, these are for you! 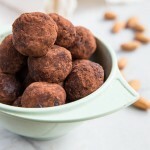 Try these Vegan Chocolate, Almond, and Date Energy Bites for a healthy chocolate snack. Remove the pits and coarsely chop your dates. 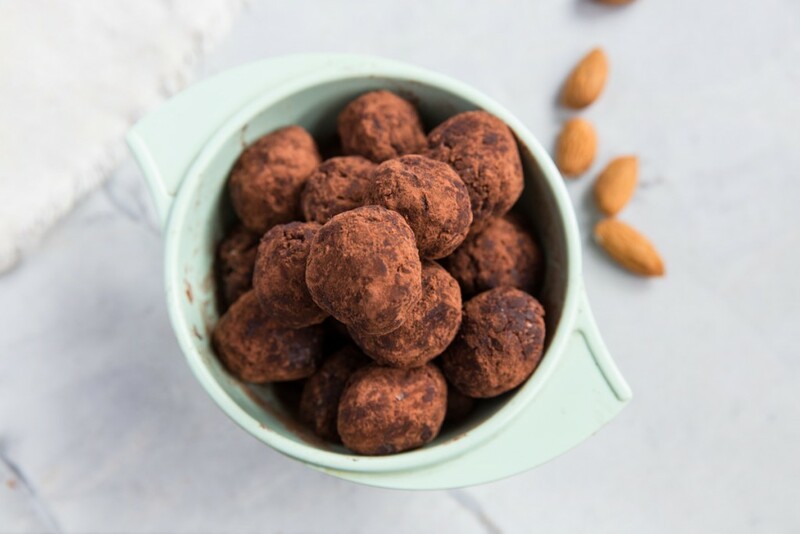 In your food processor, process the almonds until they are a coarse-like powder. Add cocoa powder, salt, cinnamon, and ginger. Add the chopped dates and process until everything is finely chopped. Gradually add agave nectar until the mixture is sticky enough to clump together or until it starts to form a ball in the food processor. Form little balls out of your mixture. You can also spoon out the mixture into mini silicon muffin baking tray then refrigerate until they harden. Once they are all rolled into balls you can then roll them in a small bowl of cocoa powder (optional). This step just makes the balls have a more polished look to them. These can be kept in the refrigerator in a well sealed container for up to 2 weeks or frozen for a few months. 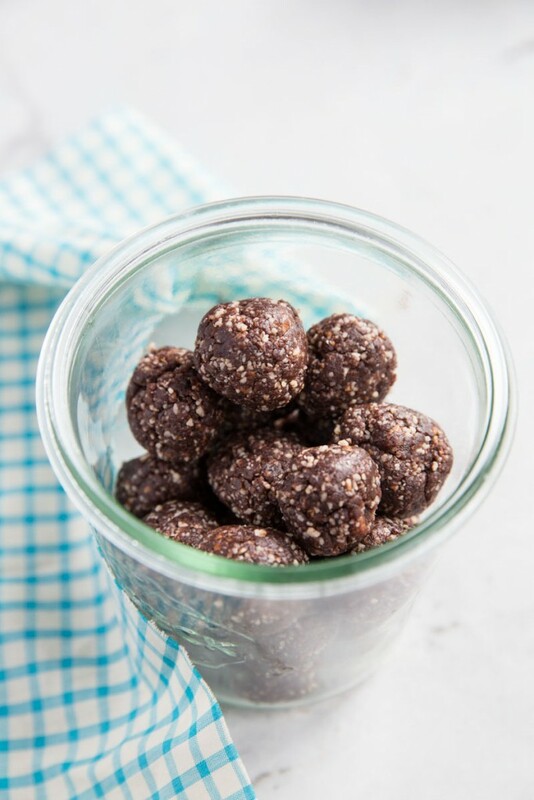 Enjoy as a healthy sweet snack! 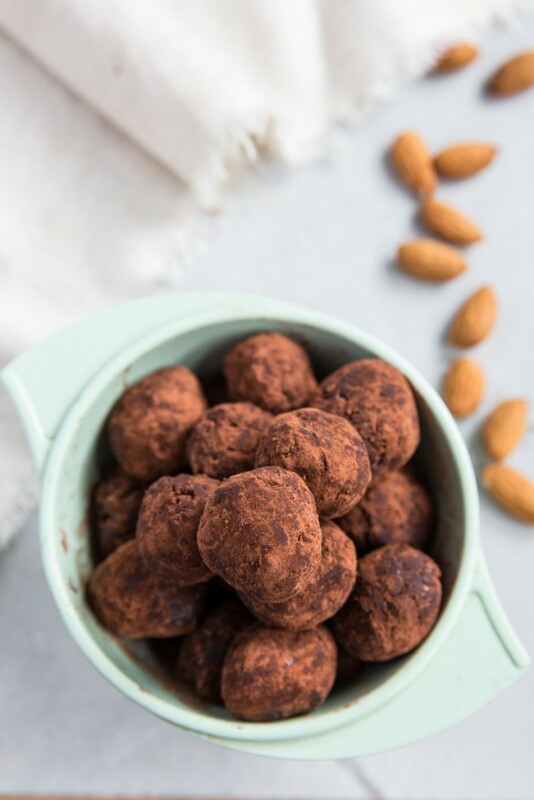 You can sub walnuts for almonds and you can choose to finish the bites by rolling them in cocoa powder or just leave them without a chocolate exterior. 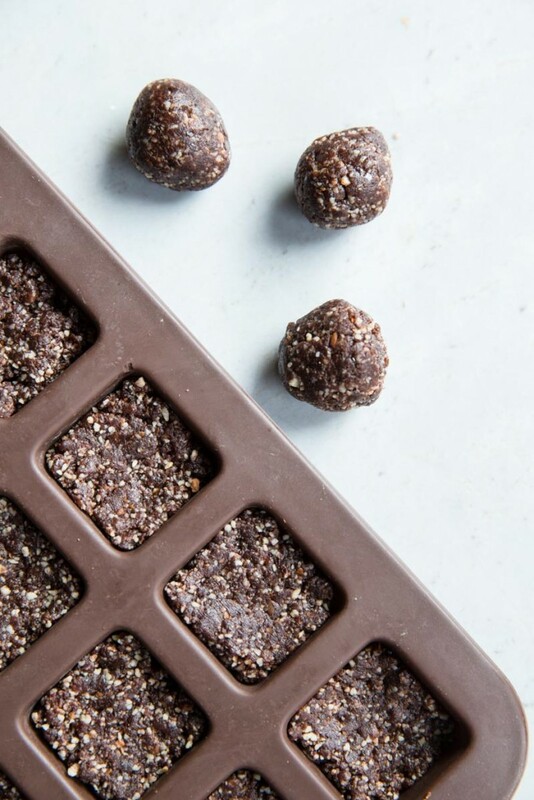 Tips: You can also choose not to roll the bites in cocoa powder at the end which saves some time and effort, and makes for less chocolate-y fingers when consuming them. And to speed up the rolling-out step a friend of mine suggested using silicon baking cups so you just spoon out the dough into the mini baking cups then refrigerate. You can then pop them out and put them in an air tight container to store them. See photos below for details. What a treat and perfect for Valentine's Day! Sounds like a wonderful way to spend time. You'll have to tell me more about this rebellious streak. Ok, sounds divine! What a pretty set up too. I love the way it is styled! What a wonderful tea time treat! I love the idea of dates in them as well as the spices. I love your sugar pot too! Lovely pictures, these look delicious! I especially like the addition of ginger. I'd be interested in playing around with different spices in the truffles! These look incredible. Medjool dates are treasures. I think I may make these to take to work to share with everyone. Thanks for commenting on my blog, it introduced me to your jewel of a blog. I will be subscribing to your RSS! anything with dates, nuts, cocoa powder…love it! Love the spice mix in the truffles! Thanks for sending the link on Twitter. Yum. Pinned this recipe–in more than one place! Can you use something else other than agave? Feel free to use maple syrup or honey.